Last week, Chrome OS version 68 started rolling out to a number of devices but, as with most releases lately, a large number of Chromebooks and Chromeboxes did not receive the update immediately. Almost immediately, we started fielding comments and emails from users expressing discontent that their Chromebooks weren’t updating to 68. Now, I understand the frustration. Especially considering some of the new features that came along for the ride in this latest version of Chrome OS. I, myself, was very disappointed to see that the HP Chromebook X2 was left out as I am very interested in seeing how the smartphone-class camera performs now that Chrome OS can actually support taking high-res images. Today, I’m happy to share that the relatively short wait for your update is likely over. 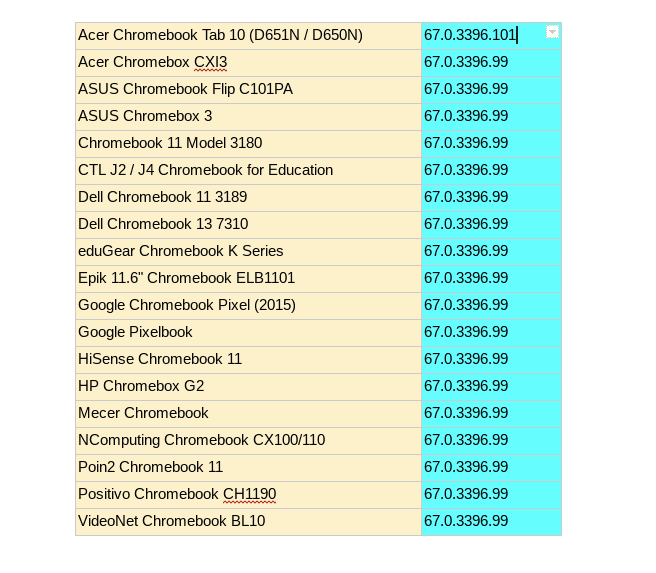 According to the Chrome OS proxy server, all but nineteen devices have now had the update to 68 pushed to them. As you can see in the image below, the devices that are still waiting for the update cover a fairly wide range from old-school Pixel to Acer Tablet and yes, even the Pixelbook. Why these devices? Your guess is a good as mine but rest assured, if you own one of these machines, the update is coming. As the Chrome OS system expands, these incremental rollouts have become increasingly more common and I, for one, would rather the developers make sure all of the rough edges are knocked off before sending an update my way. For what it’s worth, the second round of devices to get updated took less than a week to arrive. That’s not bad considering a lot of Pixelbook users waited weeks if not a month to get Stable updates in the not-so-distant past. Anyway, if you’ve been waiting for Chrome OS 68 and your device isn’t on the list above, go ahead and head to “About Chrome OS” in the settings menu and mash that “check for update” button. If you still don’t see the update, drop a comment below so we can take a closer look. Me, I’ll be checking out the camera on the HP Chromebook X2 and getting my selfie on.